Finding and reading cheap story books for babies is a great way to start some family traditions and instill a love of reading that hopefully continues throughout your baby's life. One of the best ways to ensure that kids are interested in reading is to start reading with them as early as possible, even when they are babies. Start a tradition where you read a book before nap time or bedtime, as well as throughout the day. 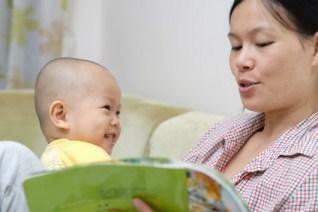 Starting a reading tradition with your child early may help with his or her reading later in life. It isn't necessary to purchase entire sets like Your Baby Can Read in order to nurture a love of reading and enhance reading skills. Instead, look for cheap books to keep your budget in line while fostering a love of reading. When it comes to finding story books for babies, it is important to keep a few key things in mind in order to select the best cheap books available. Length: Very short children's books are great for babies, but you may want to mix it up by adding in a few longer story books. Short books are excellent choices for when your baby gets mobile and his or her attention span is shortened; whereas longer books are perfect for babies who haven't learned to crawl or as a bedtime story. Durability: Discounted children's board books are another excellent choice. Most babies learn to crawl, throw and chew on things before their first birthday, making paperback and paper page books difficult to keep nice. A board book is tough and can also be wiped clean with sanitizing cloths. Storyline: The storyline is also important to consider when choosing a book for babies. Many are fascinated by the world around them, so stick to simple topics. Animals, other babies and children, colors, numbers, emotions, shapes, vehicles and things around the house are all great topics. Repetition in words and simple language are also aspects to consider when reviewing the story. Pictures: Brightly colored pictures, highly contrasting pictures and other unique visuals are a wonderful addition to any book for a baby or toddler. Discount stores: From large big box retailers to dollar chain stores, these are great places to find a lower price on books for babies. In fact, many might even offer everyday prices that are lower than the suggested retail value. Unfortunately, the selection is usually much smaller than those found in bookstores. Secondhand bookstores: Secondhand stores and bookstores are other great places to find some great story books at a discounted price. Secondhand stores often have a children's section with toys and books that are gently used, and secondhand book stores might devote an entire section to baby and toddler books. However, these stores may not have recent titles and may sell out of the best condition books quickly. Children's book clubs: Book of the month clubs are a good way to get books at a price less than you'd pay if you bought each book separately. These clubs might charge annual dues and may not have the variety you want, so be sure to check each one out. Finally, be sure to check out your local library. There is no cheaper book than one that is free, and libraries usually have a large selection of books for babies available for borrowing. The librarian may even be able to suggest some titles that other parents have enjoyed reading to their babies.